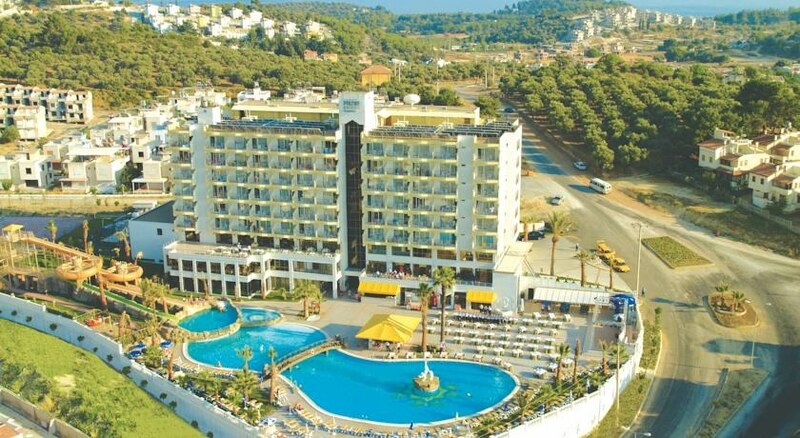 The 4-star Palmin Hotel is situated on the lovely Aegean coast of Turkey, located at the popular resort of Kusadasi overlooking Ladies Beach. Offering 156 attractive rooms, the Palmin Hotel welcomes tourists and business visitors to enjoy all their terrific facilities which include 3 outdoor pools, great Spa features including a gym, super dining and bar options, tennis and table tennis, and hosted daily activities and evening entertainment by a resident team. If you can drag yourself away, Kusadasi offers its own town, port and marina attractions plus the old quarter, and surrounding historic venues beckon. 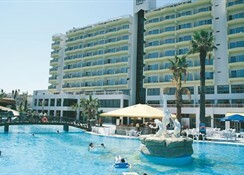 Book into the 4-star Palmin Hotel and experience a fabulous holiday - and don't forget the beach! Getting to the hotel: 70km to Izmir International Airport. 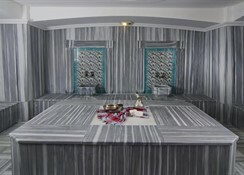 Local tips: Visit the fascinating old quarter; the vibrant nightlife in the town; the nearby historic attractions including the ancient city of Ephesus, House of the Virgin Mary; bustling city of Izmir; and the chic cafes and bars around the port and marina. Food, drink and entertainment: poolside terrace restaurant and pool bar offers Turkish dishes, and fast food snacks, and a breakfast restaurant serves a complimentary buffet-style continental breakfast; 2 Bars include the pool bar (Apr-Oct), lobby bar & terrace and Mezzanine TV lounge has big screens and soft chairs for films, football etc. ; resident entertainment team hosts daily activities and a full live show every night. nnis court, table tennis, billiards and a games room; daily activities organised by resident team. For the kids: Pool and games room. Additional: 24 hour Reception Service, housekeeping, currency exchange, laundry service, fax/copy/postal service, tourism & excursion desk, taxi pre-ordering, internet facilities, sports activities bookings, safe box facilities, wake-up calls, and a large function/ballroom provides space for banquets, meetings, weddings, seminars etc. with full catering and standard A/V equipment available, in-house shops include a market, costume jewellery, photo supplies and pictures taken onsite. Guest rooms have a decor of soft pastels, light wood furnishings and drapes and fabrics to complement, cool tiled floors and modern amenities for your comfort; features include a private furnished balcony, individually-controlled air-conditioning & heating, en suite bathroom with bathtub, shower & hair dryer, satellite TV, direct dial telephone, mini fridge and safe box. There are 126 twin rooms and 30 triples; twin rooms cater for up to 2 adults and 1 child up to 12 years old sleeping on a camp style bed. The triple rooms have 3 single beds and can accommodate up to 3 adults sharing; a number of double-bedded rooms are available and inter-connecting rooms for families are available.